At the Rainforest Writer’s Retreat, there was a friendly competition to see who who could win the highest word count (for my session, it was Keffy, who did most of a NaNoWriMo in 3.5 days). I, on the other hand, was putting down more calories (in the form of brownies and cake baked each day by other attendees) than words. 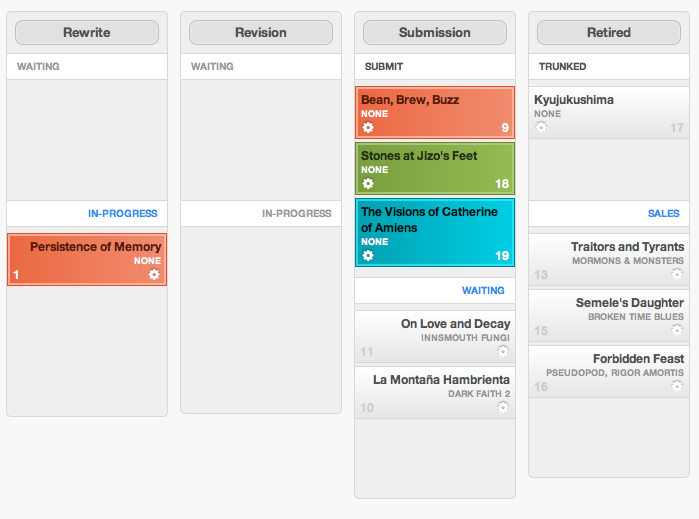 Discouraged, I decided to procrastinate plan ahead by getting a handle on all of my short story projects. I was surprised at how much this encouraging this simple act was, and wanted to share the process with you. Visualize the work that I have to do. Keep the stories flowing from ideation to publication. Focus on the most important task at hand. I use colors to help draw my attention to some stories (orange is for my top priorities, brown is a collaboration, or represents a story being critiqued) and also to prettify the kanban board. Exploration: The work here is hard to capture, but it’s where I start putting the literal or metaphorical pen to the paper: I write plot synopses and my first throwaway paragraphs/scenes. Discovering the narrative voice is the hardest thing for me to do, and I have to write and delete over and over again. But once I find the voice, I’m ready for the next step. First Draft: Finally, word count! Revision: This is the final clean up, usually after receiving close critique. Submission: If a story is in this queue, I need to send it out! Retired: This column is reserved for trunked stories and sales. Even though there’s no real work to do here, I keep this column visible so that I can see my goal for each story. Basically, this exercise helped me get over my discouragement over my low word count, and to find value in that the hours I spent: 1) in exploration for Bindings, working out plot problems, and 2) revising Persistence of Memory. These didn’t generate words, but they moved those two stories closer towards the right side of the board, and towards hopeful publication. I present it to you all in the hopes that one or two of you find it helpful. If you have a different way of visualizing your process, please feel free to share the links below. this is very inspiring… I am still trying to get a handle on managing my illustration projects, I shall have to give a system like this a try. It inspired me too, but now Kanbanpad is shut down and I’ve lost all my time spent of perfecting the workflow. Just moved to Kanban Tool and I actually like it better. Free as well, but much nicer. I have so much affection for you right now. 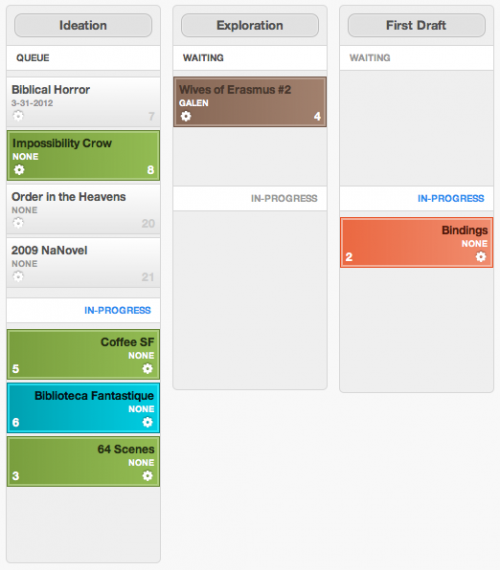 I needed a new system to organize my many, many, WIPs, and this is perfect. I have signed up and am getting organized right now. Thank you! Carrie, I was thinking a bit more about your work, but since you’re managing Dagan, I imagine that there’s a lot of non-writing tasks on there. I wonder if setting up a two or more kanbans might be helpful: one for personal creative work, one for Dagan project management? Or maybe creating one kanban with more generic columns that apply to any kind of work? Thoughts. I’m writing up my blog post on it now (will be online tomorrow). Basically I created an organization for writing, then projects within in for short fiction, non-fiction, and novels. I created another organization for editing, and then projects for DB and non-DB work. Within each project I have different columns set up depending on the stages I anticipate going through with that kind of writing (short stories are different from DB editing, obviously, but are also different from non-fiction and from novels). I love the idea of using kanban. It’d never occurred to me to queue stories that way. My main organizer right now is a calendar whiteboard where I do a monthly production schedule (so, basically a Gantt). It’s perfect for deadlining what I have in the pipe at any given moment, and for figuring out when I have availability to write something based on a sub call or take a freelance job. But I find it pretty useless for keeping an overall queue of works. Think I’ll be adding a kanban board next! Jack, I think the kanban style of management is best suited for constant flow of projects/tasks, so it works well with non-targeted short stories, where ideas stack up in the backlog, ready for the picking, but may be less useful for managing a deadline-driven queue. I am curious to see how it works in your scenario, especially if you combine it with another tool. Carrie, thank you! I can’t wait to see your screenshots! Galen, although this post has a heavy short story focus (the result of me discovering my personal workflow over the past 2 years), you can customize both the number of columns and the column labels, so it may be adaptable to your working style. You’re also in a different scenario from me in that you are successful and much sought out! So I know that your workload can seem overwhelming at times, and it may be difficult to predict what additional work you can take on. A kanban system may be able to help you visualize what’s on your plate, what’s coming in, and what’s going out. I just set up my kanbanpad project! I’m sure it will take a lot of tweaking as it goes along, right now it’s pretty simple: a queue for projects I have not started yet, a queue for projects in the ideation sketch phase, a queue for projects in progress, and a queue for final revisions. This is really interesting. I’ve started using this to manage short stories. I’m also using a spreadsheet to manage the details, but with close to 50 of them, it’s nice to be able to visualize just where they are in the process and pipeline them so I don’t feel so overwhelmed with what I feel like I am or should be working on at any given moment. I’m not exactly sure how I’ll apply this to the novel I’m working on yet, or to other freelance work, but I clearly see a benefit. Just trying this out. Fantastic! Thanks for the post.